The little girl sporting a star-strewn purple fleece jacket clutches the straps on her light green book bag and grins up at Family Nurturing Center staffers herding her toward the waiting bus. "My book bag is going on the bus-bus," Jordan chirrups. She is one of many Jackson County children benefitting from a collaboration between the respite care nursery and the Medford library. The research is clear: Reading aloud to children increases their language skills and chances of lifelong success, said Mary- Curtis Gramley, the Medford center's director. Equally important is the bonding and attachment that occurs when a parent reads to his or her child, Gramley said. "It is one of the easiest but most important things a parent can do for their child — to give them your complete attention," Gramley said. The center helps children and their families recover from trauma caused by abuse and neglect. The book bag program, funded by Jackson County Library Services and Friends of the Medford Library, promotes early literacy skills and prepares a child for reading and writing in school. "It's just a great collaboration," Gramley said. "Our children get to experience these new books. And enjoy this shared kind of experience." The book bag project has 150 bags and 480 books (360 board books and 120 paperback books). Each sturdy, green, zippered "LET'S READ" bag has the child's name attached along with colorful tags depicting which books are inside, said Nancy Peterson, outreach coordinator for the library. 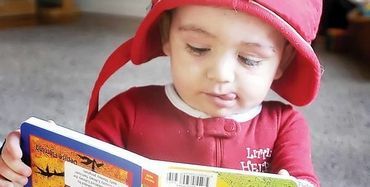 The time children spend turning pages and being read to teaches them to focus and to enjoy language through increasing their vocabulary, Peterson said. "This is where they learn those little squiggles are letters, and they make sounds, and those different sounds make words," Peterson said. "They learn about rhyming and having fun with language while learning silly words." Ducks on bikes or cats wearing hats or the misadventures of little white dogs — it doesn't really matter what the story line is, Peterson said. The quiet reading time also provides a "jump off point" to talk about what's happening on the pages, provide teachable moments, or simply discover what's going on in little hearts and minds. "It's a conversation starter," Peterson said. It doesn't even matter if the really little ones decide to give the book a taste test, Peterson said. "Board books are sturdy and stiff. This allows for the little guys to chew on them or drop them without too much damage," she said. The bags go out to the child's home on Wednesday or Thursday. And they come back the following Monday or Tuesday, said Gramley. "Some of the children are so excited, they read and bring back the books the next day," said Gramley. This latest collaboration with the Family Nurturing Center is part of the county libraries' literacy efforts. There are story-time hours offered at each of the 15 branch libraries as well as a second outreach book-sharing program that provides up to 40 books at a time to qualified childcare centers, Peterson said. Volunteers are needed to deliver books or become storytellers, she said. Donations to the libraries themselves or their Friends organizations are also welcome, Peterson added. "Because of donations, no county funds have been used for bags or for books," Peterson said. Reach reporter Sanne Specht at 541-776-4497 or e-mail sspecht@mailtribune.com.